And while getting sick isn’t the most terrible thing (your body getting sick is a sign that your body is healthy enough to detect and fight off infection), there are ways to naturally boost your immunity around this time and lessen or prevent getting sick. I’ve got a lot of different ways to approach bolstering your immunity, and which ones will work the best for you depend on your whole health picture, and what else is going on in your life right now. 70 to 80% of your immune system is in your gut, so the healthier your gut is, the stronger your immune defenses can be. Prioritizing your gut health, depending on your overall gut health, could look like several different things. If you know you have more complex health issues, consider checking in with your nutrition or medical professional to see which one of these ways works best for you and your current health situation. If you’re a fast eater, try slowing down how fast you’re eating. You body needs time to register hunger (around 20 minutes), and if you eat too fast, you can throw off satiety signals and eat too much too fast, or get hungry later. Also, when you eat too quickly, it can prevent enough saliva from being made to break down your food. Food that’s not broken down enough can rot or putrefy in your digestive system and cause problems. Put down your fork in between bites. Take a deep breath before and during your meal. Piggybacking on the previous point, if you don’t break down your food enough in your mouth, it can rot or putrefy, because your saliva and stomach acid can only break down your food so much. Also you can’t get to as much or any of the nutrients in your food if they can’t be broken down the size your body can absorb them at. When you’re chewing, pay attention to the food in your mouth. If it feels liquidy enough, swallow. Finish fully chewing and swallowing before taking another bite of food. The more you can up the nutrient dense, whole foods (veggies, fruits, nuts, seeds, protein, soaked and sprouted grains) you can add to your plate at any meal, the more you’re giving your body the nutrients it needs to support your body. By eating more nutrient dense foods and cutting down on overly processed and refined foods and sugars, you can also help lower your inflammation and support the inflammation and anti-inflammation process. When you eat more processed foods, especially those higher in refined oils (which is most processed foods), your body has more prostaglandins that support inflammation, and not enough of the prostaglandins that support anti-inflammation. Add 2-3 additional vegetables to your meals. Take one food in your pantry with refined vegetable or seed oils (read this great article for a list). Probiotics can help support and balance the bacteria that’s already in your gut. This bacteria keeps things in balance, bolsters your immunity and a lot more. Depending on your preference, you can add in probiotics through eating probiotic rich foods (more about what those are here) or through taking probiotics in supplement form. Not all probiotic supplements are the same quality, and depending on your health history may not be as effective for you. Consider talking with your nutrition or medical professional for recommendations. Add in some probiotic rich foods to 1-2 meals a day. Add in a daily probiotic supplement. Staying hydrated is a very simple way to support your immunity. Water has a lot of roles in your body, from transporting nutrients, lubricating your joints, regulating your body temperature, and flushing toxins from your body. The more you can stay hydrated, the more you can keep any possible toxins moving through your body and the rest of your body feeling good. Drink at least half your bodyweight in ounces per day. Add an additional 8-12 ounces per each cup of tea or coffee. Jazz up your water to help help your chances of drinking water, if you’re not a fan of drinking water. Sleep is an essential part of regulating your mood, memory, as well as time for your body to repair itself and recover. Without enough sleep, your body won’t have the vital time it needs to keep you functioning during your waking hours as well. Depending on your schedule and life circumstances, try to get at least 7-9 hours of sleep. Make sure when you’re sleeping, you’re sleeping in a dark room with little to no light that’s a cooler temperature. Also give your body time to wind down before bed and consider a night time ritual to help cue your body to wind down. Put screens down and away 30 minutes before bed to help you wind down. Set a consistent bedtime and try to stick to it. With the amount we all sit at desks or just sit, this can be a good time of year to add in light movement, which can be as simple as going for a walk. Light movement can also help you lower some stress, change your scenery, and give yourself a moment to connect back in with yourself. Take a 5 minute break during the day to walk, even if it’s up and down the block. If you work out a lot or have a rigorous movement practice, consider take 1-2 of those sessions out of rotation for now. While movement can make you feel good, if you’ve got a lot on your plate, and pushing hard and not getting enough rest, you’re dumping a whole lot more cortisol into your system. And too much cortisol over a sustained period can definitely affect your immunity (and your overall health). Dialing down the amount of reps or weight you’re doing in your sessions. Cutting out 1-2 sessions, especially if you have a lot going on and feel tired. Switching to more restorative forms of movement (pilates, yin yoga, walking). You can so easily get rundown physically, emotionally and energetically, and then get sick, by not setting boundaries and taking on too much, whether that’s for yourself or others. By setting boundaries, you define clear limits on how you spend your time and energy, which also means you have time set aside for things that help you take care of yourself, like cooking, sleeping, some movement, relaxation. You can listen more about boundary setting in this episode of the Small Steps podcast. 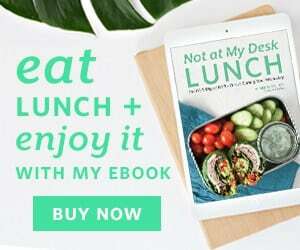 Start setting small boundaries around things that just involve you (setting a bedtime, not going into the breakroom at work, taking a lunch break, not checking your work email after work). See where you can set smaller boundaries with other people. Constant stress (aka your buddy cortisol) can wreak havoc on our immune system. During busy times of year, stress usually runs at high volumes than normal. Build in some fun or joyful moments, things or exchanges in your day. They can be big or small, from talking with a friend, hugging someone, smelling some flowers, and yes, even eating something you enjoy. The more you can balance out the busyness with joy and fun, the easier it can be to navigate and not overload your body with stress. Send a text to someone you care about, saying that you’re thinking of them or how much you appreciate them. Do one small fun thing a day that you enjoy. Practicing whatever forms of self care appeal to you can help you stay grounded, happy, and take care your energy, mental and physical health (depending on what that self care is). The more you’re taking care of yourself, the less likely you are to run down your immune system. 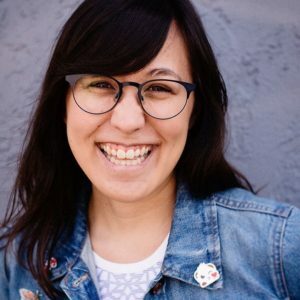 If you’re not sure what kind of self care will work for you, listen to this episode of the Small Steps podcast to get some ideas. Try practicing 1-2 ways of self care per day. Add more if you’re already practicing self care and feel like you could be run down. When we try to do it all, that’s when we get burned out, run down, and sick. Consider asking for help, whether that’s from a friend, partner, or family member with things you have on your plate. Make sure when you’re asking for help and taking things off your plate, you’re not just adding more things to your plate. That will definitely keep you worn down. Take an inventory of all the things you have on your plate and see if you can ask someone to help you. Find something concrete to do during that time, ideally something related to self care, so you don’t schedule something else or don’t get the rest and relaxation you need. 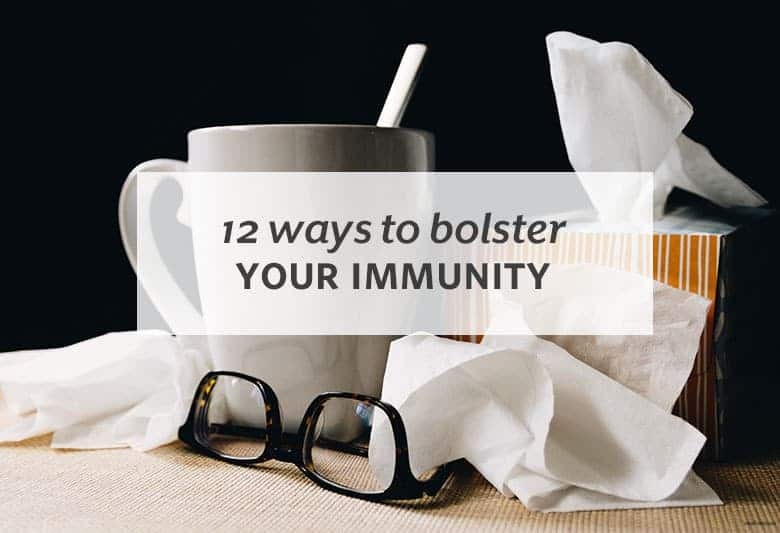 There are so many ways you can bolster your immunity during busy times. Some that have to do with the more “traditional” routes, like nutrition and water, and some that have to do with how you manage your energy. Choose ways to bolster your immunity that speak to you, maybe because you know you need to work on them, or because you want more of that in your life. And if you do get sick, that’s okay. All of your immune bolstering efforts were not a waste, and you didn’t fail. Sometimes getting sick is out our control, and giving yourself time to rest and recover is just as vital to letting it go through your system rather than linger for weeks because you’re ignoring it.